Lusciously creamy, easy to make, and a family favorite dinner! 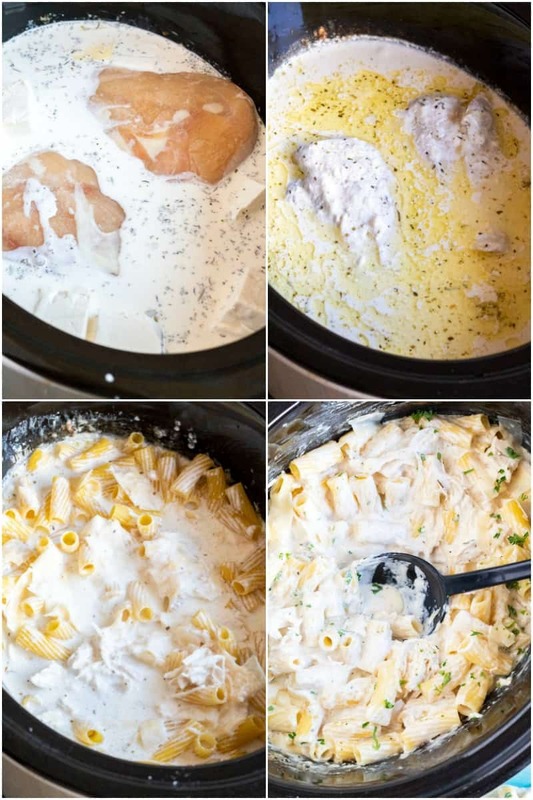 This Crock Pot Chicken Alfredo is great for serving a crowd, or store half in the freezer to reheat later! Ever since I was a kid I’ve been a fettuccine alfredo addict. I’d order it everywhere we went. I mean really, it’s like the best mac and cheese ever and you feel all fancy getting it. 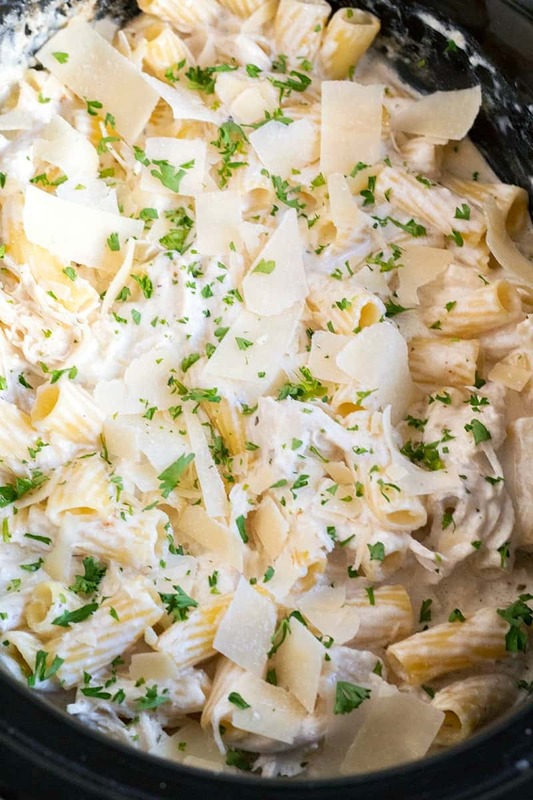 Now that I’m grown up I still love a good alfredo recipe and this Crock Pot Chicken Alfredo might just be about the easiest way to get your alfredo fix for dinner! Add the sauce ingredients and chicken (raw or frozen) to a slow cooker. Cover and cook for 2 to 6 hours. Cooking time depending on if you use HIGH or LOW setting and if chicken is raw or frozen. Remove chicken and shred it. Return chicken to slow cooker. Add uncooked pasta and Parmesan cheese. Cover and cook for 30 mins on HIGH. Stir everything together and top with more parmesan and parsley for garnish. I was a little worried about cooking pasta in the crock pot and having it actually cook through, but it totally worked out. The sauce is already hot from cooking the chicken and the pasta came out pretty darn good if you ask me. Next time I think I’m going to make my crock pot chicken alfredo with broccoli. I’m trying to get more veggies in my diet and broccoli + cheese is okay with me. If you want to mix things up a little more you could swap out the pasta for refrigerated tortellini and have chicken tortellini alfredo. That actually sounds pretty amazing. You can add some sun-dried tomatoes once everything is done cooking or some roasted red peppers. I’m a purist when it comes to chicken alfredo, but sometimes it’s fun to mix things up. 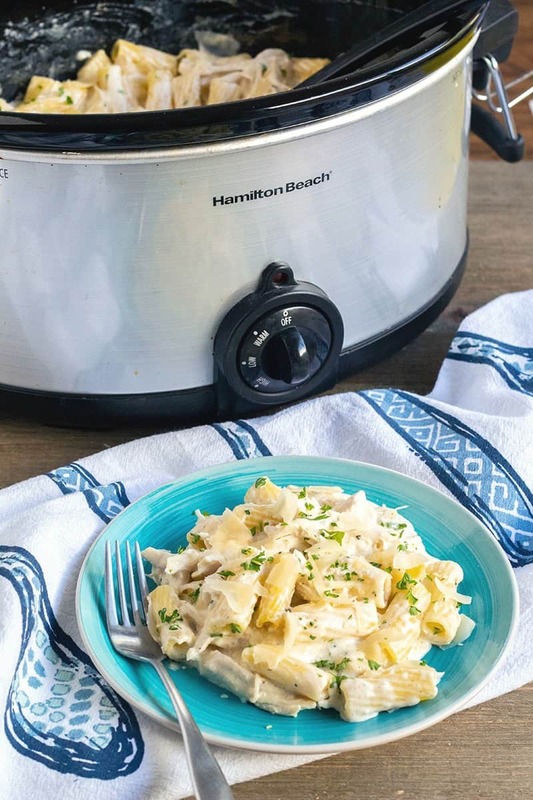 This easy Crock Pot Chicken Alfredo recipe is sure to become a family favorite they’ll ask for again and again! If you can’t get enough of letting your slow cooker do the work for dinner, then you’re in luck! 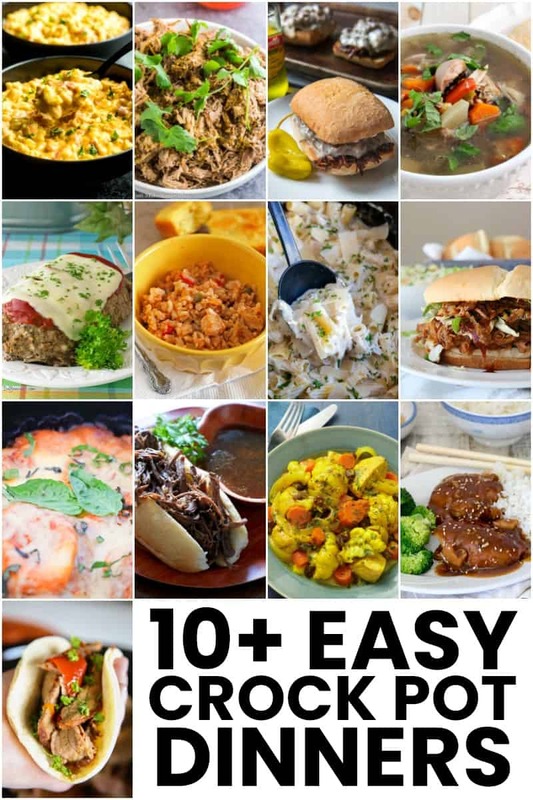 Today we have over 10 crock pot dinner recipes that’ll feed a crowd and let you relax. Each one if a family favorite they’ll ask for again and again. To your slow cooker add the chicken breasts, heavy cream, chicken broth, butter, cream cheese, salt, Italian seasoning, pepper, and garlic powder. Cover and cook for 2 hours on HIGH or 3 to 4 hours on LOW. Remove chicken and shred it. Return chicken to slow cooker and add pasta & parmesan. Mix to combine. Recover and cook for 30 minutes on HIGH or until pasta is tender. Remove lid and stir on more time. Top with parsley and extra parmesan cheese if desired. I have had reader feedback that the pasta needs to be cooked before adding into the crock pot. I haven't run into this issue with my crock pot, but every slow cooker is different and cooking times may vary. Option A) Add the uncooked pasta and cook in the crock pot with everything until pasta is al dente. Option B) Cook the pasta to al dente according to package directions, and then add to the crock pot as directed. I used frozen chicken breasts for this recipe, and they needed just under 3 hours on HIGH to reach 165 degrees F internal temperature. If you're using raw chicken (not frozen) start checking your chicken around 2 hours. If you want to cook this recipe on LOW temp, you'll want 5 to 6 hours with frozen chicken or 3 to 4 hours on HIGH. This important thing is to make sure the chicken is cooked through before moving onto to finish the recipe. yum! 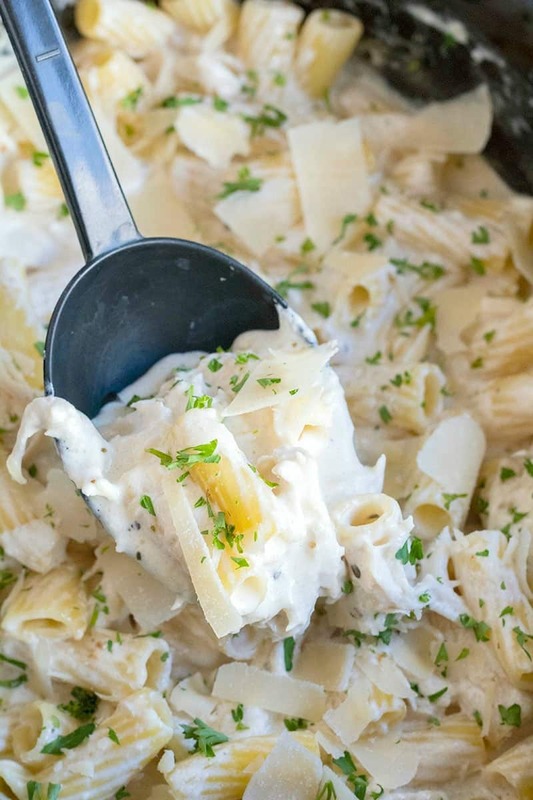 Fettuccine Alfredo is always a favorite, this is such a great recipe! This looks so decadent and EASY! I need this in my life like yesterday. This turned out wonderful thank you! This turned out amazing. Thank you! What about adding Broccoli to this. How soon would you suggest? Hi Carly! The recipes I’ve seen add broccoli in 30 minutes to an hour before everything finishes. So you could add the pasta, stir everything up and then put the broccoli on top (not stirred in) and let it cook until the pasta and broccoli are both tender. Hope this helps! Looks so good!! Can you use half and half instead of heavy cream? Oh my god! Just made this and it’s was so amazing. Best Alfredo I’ve ever had, and it was SO EASY! Thanks so much, I’ll make it again soon for sure. Thank you ! I am about to make this recipe with frozen chicken. So I cook it 6 hrs on high or low? So I’m going to be making your recipe but with 4 pieces of chicken. So do I know to doudle everything in your ingredients or no? Hi Denise! You could use sausage links instead of chicken if you prefer. You’ll want to cook the sausages and sauce on HIGH for 2 hours or LOW for 4 hours. (I have seen some recipes say LOW for 6 hours, so just be sure to check the internal temperature is 160F.) The sausage juices will alter the alfredo flavor a bit, but it should still be delicious! How big of a crockpot do I need to double your recipe? I’m adding broccoli and am also concerned about 2 lbs of pasta overflowing mine. Thank you. Hi Brian! 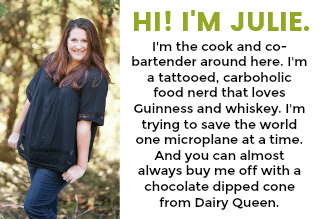 I use a 5-quart crockpot for this recipe. They make an 8-quart size, so I would go with that, or borrow a second 5-quart crock pot from a friend and make a batch in each. Hope this helps! I was kind of skeptical about cooking the pasta in the crock pot just like you. HOWEVER this recipe turned out great. I added chicken broth with garlic in it and bumped up the measuring to 1 1/2 cups chicken broth. Other than that I followed everything else. This recipe now becomes a family favorite INSTANTLY!!! Could you cube the chicken prior to cooking and skip the shredding part? Would it alter cooking time? Hi Autumn! The cooking time could come down a bit since the chicken isn’t as thick as a whole breast, or you could cook for the same time and really let the flavors of the sauce get into the chicken. If I want to cook this for only two people… would I just half the ingredients? Do I need to adjust the cooking time at all? Hi Carol! You would half the ingredients, and the cooking time would remain the same. You still need to get the chicken cooked through. The pasta portion of the recipe may not take quite as long, just be sure you cook to al dente. Can you use rice instead of pasta ?? Hi Brian! You can omit the pasta, finish the recipe as directed, and then mix in some cooked rice if you prefer. This recipe is absolutely AMAZING!! Everyone always goes for seconds. I tried cooking the noodles in the crockpot, but they didn’t cook enough. I now cook the noodles separately and I prefer this recipe to any I have had in a restaurant. I’m using 3 thawed chicken breast. How long on low? Hi Kelly! You’ll want to start checking the chicken at 4 hours in on LOW heat. Make sure the internal temp is 165 degrees F. You can also take a breast out, make a little cut and check it’s not pink inside if you don’t have a meat thermometer. Hope this helps! Hi! Saw some comments about the pasta not cooking.. Was wondering if you were cooking on HIGH or LOW when you put the pasta in?? Perhaps that could be why? And if I cook the pasta separate, do you think it would taste different? Hi Angelica! I was cooking on HIGH while the pasta was in the crock pot. If you cook the pasta separate you’ll be totally fine. Mix it into everything in the crock pot and let it sit for a few minutes to get that yummy sauce all over the place. Hope this helps! Hi Bob! I’m not a mushroom eater, but that being said I’ve seen plenty of parmesan cream sauce pastas with mushrooms so I think you’d be just fine to add them. 🙂 I did some research and it looks like you’ll add in sliced mushrooms with the chicken and let them cook the whole time. Hope this helps! I made this tonight. Oh. My. Gosh! So good! I didn’t have bullion so I used a can of French Onion Soup and adjusted the seasonings accordingly. I was apprehensive about cooking the dried noodles in my ancient (and tall Presto) Crock-Pot, but it worked like a dream! Perfect, al dente noodles without an ounce of effort! I used a liner for quick clean up, and halved the recipe to make it for two; admittedly, I didn’t measure, but it was awesome! I really couldn’t be happier! Very good flavor!! Will def make again. My chicken was frozen and turned out great. The only thing is can get dry after adding pasta, and my family likes it with more sauce. I will double the sauce recipe next time! Other than that would not change anything. I’m so glad your family enjoyed it Keri! My husband is into sauce too, I hear ya on the extra sauciness. 😉 Thank you for the feedback!! Hi, I’m going to try this today using frozen Chicken cubes(cooked) do i still use the times posted, also, i’m going to use Tagliatelle,do i allow the same timing as for other pasta or a little less? So are the ingredients a substitute for alfredo sauce or are we still adding alfredo sauce? Am a bit confused! Hi Chris! All the ingredients listed make the alfredo sauce. You don’t need to add any pre-made alfredo sauce to this dish. Absolutely loved it! Next time I do want to have more sauce? Would I double the whole recipe besides the pasta ? Or just the heavy cream and chicken broth ? If you want double the sauce, double everything except the chicken and pasta. You made a little 1 Tbsp cornstarch + 1 Tbsp water slurry to help thicken things up before adding the pasta in though. Hope this helps! I tried this today for my husband and I. As someone who is currently spending more time at home, the crockpot has been my bff and this beats making the same-old, same-old recipes. Husband loved it and I’m sneaking leftovers to bed at 11pm! Bow tie pasta would be a great option in substitution of rigatoni, too. How large is the serving size? Is it 917kcal per serving? Hi Natasha. 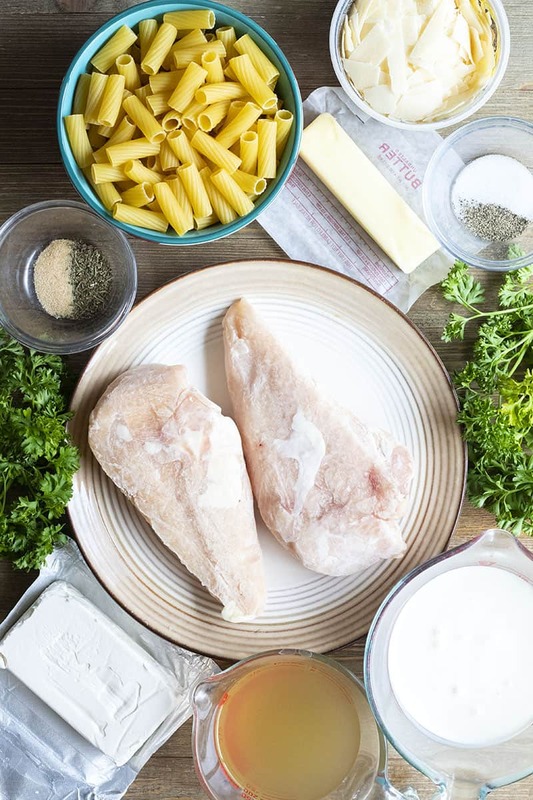 The serving size is 1/8 of the recipe (about 1/2 pound chicken and 2 ounces uncooked pasta), and the nutrition assumes everything in the pot will be consumed (no sauce let behind!) 😉 I did just go through and double check all the nutrition counts per item against another nutrition calculator, because 971kcal seemed a bit high even with all the pasta, heavy cream, and cheeses. Some of the auto fill numbers were pretty high. With the updated nutrition (live on the recipe now) we’re down to 752kcal per serving. Hope this helps! This recipe is the best alfredo recipe I have ever made! Very easy to make. Love it! For two thawed chicken breasts, how many hours on low?